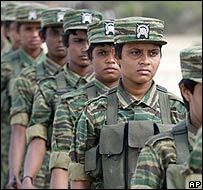 Sri Lanka's Tamil Tiger rebels are maintaining a defiant stance, in spite of the government's recent announcement that it had driven them from the east of the country. The rebels still hold a swathe of territory in the north, where they run a civil administration. A ceasefire agreed between the two sides in 2002 still stands on paper but has broken down on the ground. In the rebel's de facto capital of Kilinochchi, the Tamil Tigers insist they are not losing the war. Evidence of that can be seen at a nearby training camp hidden in the jungle, where their fighters are put through their paces. Men and women fired assault rifles and rocket propelled grenades. And they attacked a mock-up of a fort. It was a show of strength to counter the military's boasts about a decisive victory in the east. "Gaining territory is not a victory, it is a false hope," said Lt-Col V Nishanthan, who led the training. He cites earlier stages of the war to support his argument. "For example in the Jayasikuru operation, territory they captured in a year was lost in a week because of our offensive attacks. "That clearly shows we will again come out and attack them and defeat them." The military's announcement came last week when they said they had captured the rugged jungles of Thoppigala. It followed months of fighting in which the Tigers were driven first from towns and villages on the coast - and then areas inland. The rebels - who claim the east along with the north for a homeland for the Tamil minority - say they still have fighters on the ground and have switched tactics, going into what they describe as guerrilla mode. And they insist the Sri Lankan armed forces will struggle to hold on to their gains. Government officials have said their aim is to wipe out the military assets of the rebels, although they also say they are open to peace negotiations. The rebels have rejected the offer as insincere. The focus of the fighting could now shift to the north, where the rebels still hold territory including Kilinochchi. It is their de facto capital, a town of scattered small buildings around a main road which carries far more bicycles than cars. The Tigers run a civil administration in the north with quasi government offices and courts. There are even traffic police wearing badges with the rebel insignia of a roaring tiger's head. The Tigers say they will now use all their resources to strike back at the Sri Lankan Government. They have ground forces, a naval wing and light aircraft which have been smuggled in and modified to carry bombs. And they aim to hit Sri Lanka's economy. "The Government has opted for a military solution," said the head of the Tiger's political wing, SP Thamilselvan. "They are quite comfortable in taking that forward. Our next step will be to weaken the government on the economic front that sustains their military capacity." 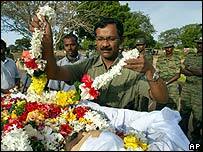 We watched in Kilinochchi as the Tigers were burying the latest casualties of war. Weeping relatives, local people and rebels in uniform stood in rows listening to the sombre music. The coffins were draped with the rebel's flag and a lone gunman standing on a pedestal sent a burst of rifle fire into the air in a final salute. At the end the mourners lined up to put a handful of dusty earth into the graves. The cemetery for the Tigers' dead in Kilinochchi is large, with row upon row of identical pale grey headstones. Nearly 70,000 people have been killed in Sri Lanka's war, which began over a generation ago. After the 2002 ceasefire brought a lull, the fighting has resumed, and neither side is talking peace.